It’s a weekend for strange weather. We’ve had heavy snow down south, and way below normal temperatures up here in New England. Dakinikat said it was only about 38 degrees down in New Orleans today. My aunt lives down on the coast in Alabama, and they only had temperatures in the 40s. 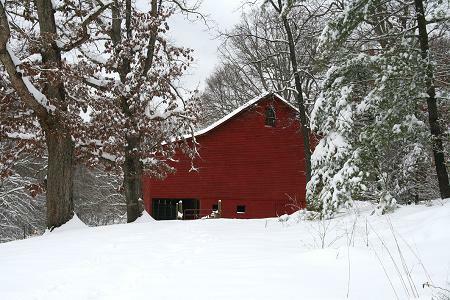 Our Virginia Conflucians have had heavy snow today too. 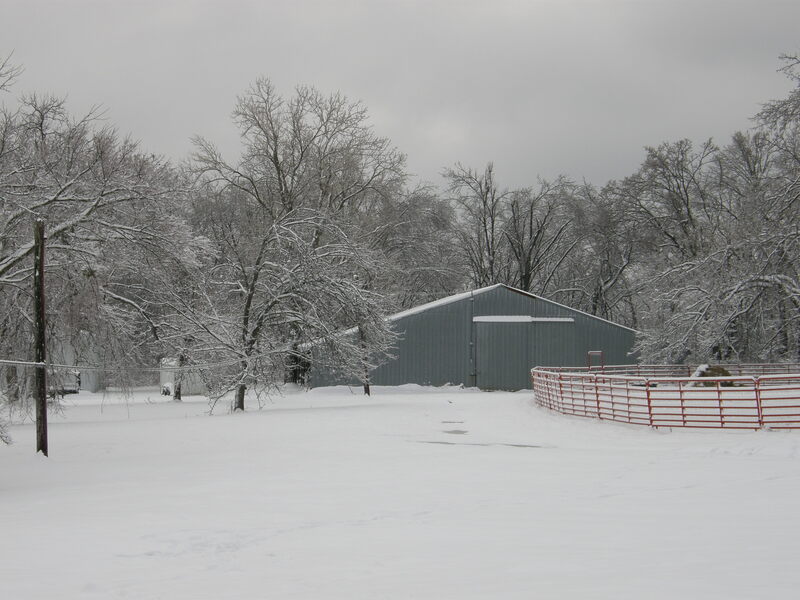 Here’s the picture that Indigogrrl took of her barn this morning. I’ve always found weather exciting. Even though I don’t love dealing with snow and ice, I still find big snowstorms kind of thrilling, and there is a nice feeling I get when I know I’m snowed in and don’t have to go out till the storm is over. I love thunderstorms too. I was born in Fargo, North Dakota, in the middle of a terrible blizzard. My mom actually had to go to the hospital a day early because the doctor was afraid if they waited, she wouldn’t be able to get there. I’ve heard stories about extreme weather from my parents all my life. Maybe that’s where my fascination with weather comes from. My mom often talked about having to dig a tunnel out of the front door of their house back in Hope, North Dakota, in order to get to school. And my mom has talked about the time the temperature went up over 120 degrees, in 1934. That same year in the winter it got down to 60 below 0. 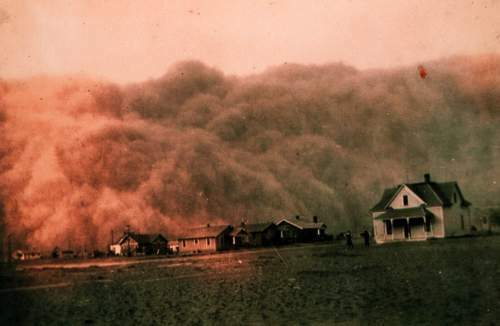 That is still a record for extreme temperatures in one location in a year, and it is still the hottest year on record in the U.S. Those were the dustbowl days. My mom says the dust storms were horrible. I found this photo on-line. I’m not sure where it was taken. In Fargo, where my dad grew up, they have periodic floods when the Red River overflows its banks. Those can get really bad. 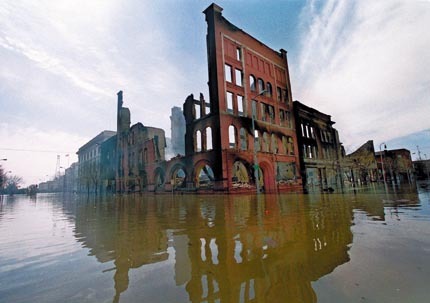 In 1997, a flood completely destroyed Grand Forks. Much of the downtown burned and had to be rebuilt. 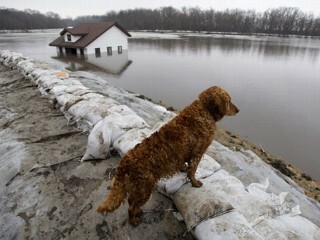 This picture was taken in Fargo during the big flood a couple of years ago. My first fully conscious experience with extreme weather came when I was three years old. We lived in Iowa then, and we experienced a tornado. I still have a picture of my three-year-old self sitting on a huge fallen tree. 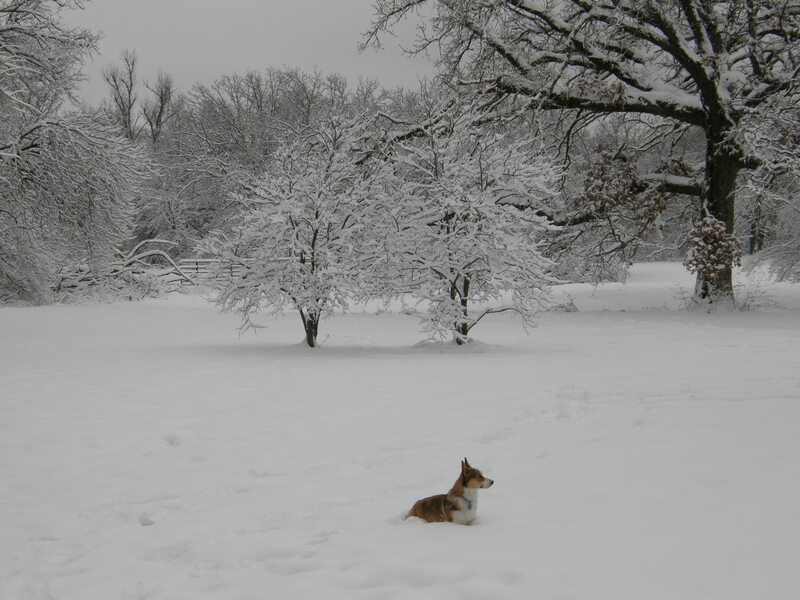 The next year, we moved to Kansas where I was exposed to extreme heat. Many of my memories of Kansas involve us kids playing outside on 100-degree afternoons while our parents took shelter inside. I’ll never forget the day it went up to around 115 degrees and the heat broke the big thermometer in downtown Lawrence. 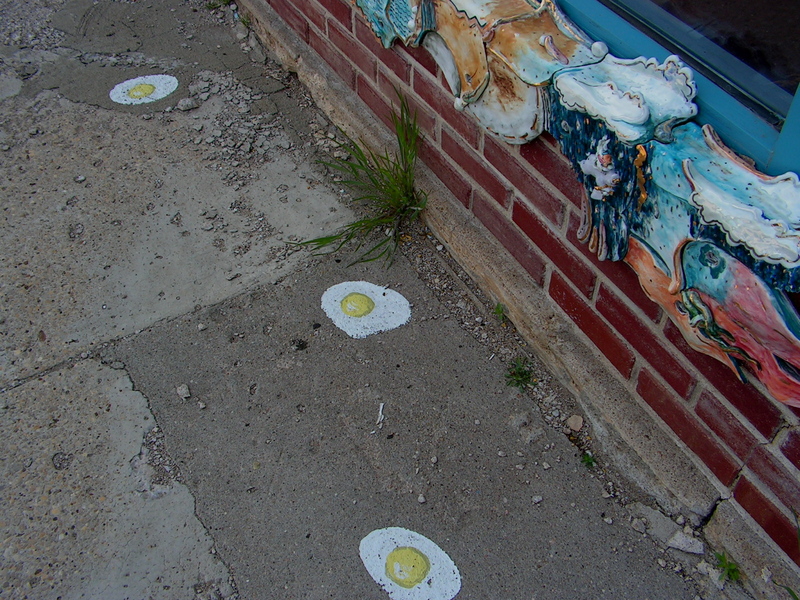 Of course there were the usual pictures in the paper of people frying eggs on their sidewalks. Here’s a classic of the genre. Hot enough to fry eggs on the sidewalk! Here in New England we get some pretty extreme weather at times–though not as extreme as the hurricanes down south, the tornadoes in the midwest, or 40-below-zero days they get up in the north country where I was born. But we get some wild nor’easters–those can be really bad, and if they come in the winter it can mean a blizzard with a couple of feet of snow. In February of 1978, Governor Dukakis had to close down the entire state for a week because of the terrible blizzard we got. 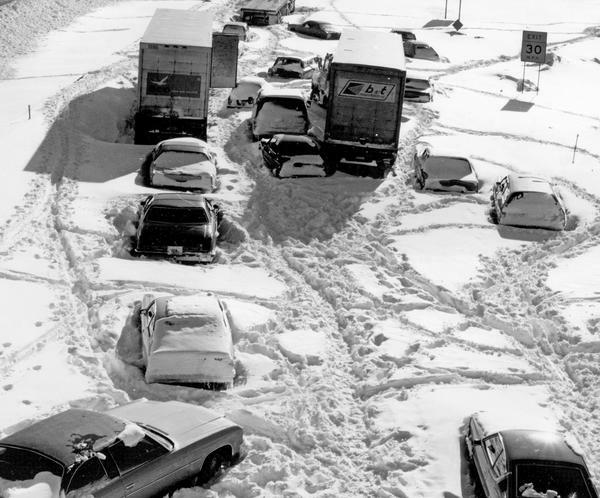 Here’s a shot of a highway north of Boston after the ’78 blizzard. Of course New England weather is notoriously unpredictable, and we never know when we’ll get a snow or ice storm in April or even May In the late summer and fall, we often get the tail-end of hurricanes, and once in awhile we get a full-blown hurricane. One October in the 80s we lost our electricity for a week because of a hurricane–I think it was Gloria. This is an open thread, but if you’d like to share your extreme weather stories, please do. Please send good vibes to my home town, Fargo, North Dakota, and the entire state and region. I’ve been following the story for a few days now. The state has been declared a disaster area and FEMA is already up there to help. North Dakota is in a race against time as residents try to shore up huge sandbag levees ahead of massive flooding expected to hit this weekend. Forecasters predict the Red River’s waters will crest at 41 feet by early Saturday, exceeding record levels set in 1997. Along the river, residents engaged in a frantic battle against the fast-rising water and bitter cold. Water reached 35.6 feet in Fargo by midday Wednesday, according to the National Weather Service. City officials said they’ll add another foot to the dikes — already 42 feet high — in an effort to withstand the river’s crest. Mayor Dennis Walaker said the city is bracing for the worst. “We’re talking about levels never reached before by any stretch of the imagination,” he said. A 41-foot crest in Fargo would be two feet higher than the record level of 39.6 in April 1997, when the area was struck by one of the largest and costliest floods in U.S. history. In some good news, a pair of rare clouded leopard cubs have been born at the Smithsonian Zoo in Washington DC, and they were rescued before their mom had time to harm them. Apparently the dad’s sometimes kill the moms too! early yesterday, despite murderous tendencies in the captive species, two newborn clouded leopard cubs were found alive, well and squealing at the National Zoo’s Conservation and Research Center in Front Royal, Va. They were taken immediately from their gorgeous mother before she could do them harm, or do them in, placed in an incubator set at 88 degrees and fed salt water from baby bottles. Born with dappled, reptile-pattern fur, they were the first such births at the zoo in 16 years. Their births were a coup, and the end of a complex reproduction saga involving an exotic, endangered and beautiful species of animal that experts call the ghost cat. It was also a genetic home run: The zoo said the cubs’ genes, which come from outside the captive population, make them among the most valuable clouded leopards in North America. More photos at the link above.